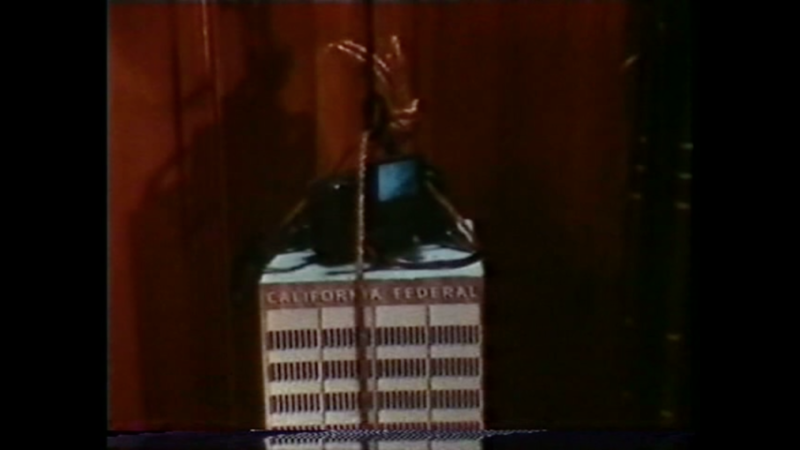 Julie Becker, Federal Building with Music, 2002 (still). DVD, projector screen and wooden bench. 29:08 min. Courtesy Greene Naftali, New York. When she was 43 years old, after struggling with addiction and mental illness for many years, the artist took her own life. Unicorns and force-fields; sweetness, sparkles, little dogs and light. The storefront studio on Sunset Boulevard where the artist also lived was a storeroom and lab, to which domestic touches had been added over many years as it became clear that this would be her permanent domain. ... And he realised something that in his heart he had always known: that the Whole is impossible, that knowledge is the classification of fragments. From about 2000 until her death in 2016, the artist launched herself into an unfinishable, ongoing project known that she titled Whole. She began constructing it in the basement of a ramshackle, bank-owned bungalow where she briefly lived. The bungalow was perched halfway up on the hill on Morton Street in Echo Park. The bank had given her a rent break in exchange for clearing out the unclaimed belongings of the previous inhabitant, who’d died of AIDS. Founded in 1926, the California Federal Bank was absorbed by Citigroup in 2002. Its demise fell somehwere between the Savings & Loan crisis of the 1980s and the Dodd-Frank Act of 2010. WE MUST CONTENT OURSELVES WITH THE MYSTERY, THE ABSURDITY, THE CONTRADICTIONS, THE HOSTILITY, BUT ALSO THE GENEROSITY THAT OUR ENVIRONMENT OFFERS US. The memorial for the artist was as inconclusive as her work, or anybody’s life. Organised haphazardly on Facebook by one of her old friends, it was held beside the ‘lake’ in Echo Park in the middle of a heat wave on a summer Sunday afternoon. For an hour after the appointed time, ten or twelve of us sat around in thin wedges of shade waiting to see if others would show up. But no one did. And then Eve Wood, a former classmate of the artist’s from CalArts, recalled her striding through that long concrete gallery on the first day of school, tossing Gerbera daisies into the air from a bouquet. And then the artist’s father, who’d studied art but worked a series of odd jobs and never pursued a gallery career, talked about their aesthetic differences as if they had been peers. A photograph of the artist, taken at her graduation from CalArts shows her smartly dressed in a black blazer and a patterned shirt with its wide pointy collar perfectly arranged over the lapels. She’s wearing sunglasses. Her long hair, parted to the side, flows neatly down her back. As if to say: she’s left behind a childhood marked by constant shifts from one Move-In Special to the next in low-rent apartment complexes across LA. She’s every inch the gallerina. The photo could have been taken here. ‘You could hear in her voice how badly she wanted it’, Eileen Myles wrote about listening to a reading by the young Patti Smith. ‘Someday I shall write about this in greater detail’, Peter Handke concludes his elegaic essay on his mother’s suicide (A Sorrow Beyond Dreams). Of course he never did. Rectangular windows cut into the concrete walls looking out over a lawn. Behind it, blocking the horizon, a single line of towering trees. Invited to judge a non-fiction competition for a Midwestern university pres, she was amazed that every single manuscript comprised a different recitation of American childhood. Some were told retrospectively, the authors having recently become parents themselves; some were immigrant; some were gay. The United Solipsists of America. USA. Among my old notebooks I find one labelled ‘CAPITAL – notebook #2’. It’s a notebook I kept during my first year in New York, which was most likely 1976, although I’ve lied about these dates so long in an attempt to keep my age, or generational identity, ambiguous, I really can’t recall. The notebooks came from a class I took with Arthur Felberbaum at the New York Marxist School on the second floor of a building in the West Village on Sheridan Square. By day a dentist or accountant, Arthur founded and administered the school and taught a class on Marx’s Capital, its core text. Patiently, night after night, he explained Capital’s complex equations to a handful of us in a classroom that comprised a blackboard and some folding chairs. A barrel-chested man in his late 40s, Arthur taught with fervid discipline. Classes ran at night, in deference to the School’s (presumably) working class constituents, although none of us held actual jobs. I retailed subway slugs; others collected unemployment or SSI. Arthur despised capitalism with the most luminous, and at heart utterly reasonable, form of hate. Dressed like a math teacher with plastic pen-protectors in the pockets of his shirt, he was a born raconteur. Sometimes, he’d digress from explaining the equtions written on the board (IIc + IIv + IIs = Iv + Is + Iv + IIs) to tell us stories drawn from life that were, to him, the logical extension of the laws set forth in Capital. To Arthur, it was all dazzlingly clear. He’d just come back from demonstrating against the arrest of Black Panther educator Assata Shakur, who’d been detained in New Jersey’s Clinton County Correctional Facility for a muder she did not, could not have possibly, committed. Assata, a frail woman in her mid-20s with a BA from Hunter College, had, like Arthur, grown up in the Bronx and he recounted the beatng inflicted on her, chained to a hospital bed, as if they came from the same family. Like all of the most scorching hatreds, Arthur’s was driven by love. It was his belief that anyone can understand and change the world. To understand society, read the Wall Street Journal, Arthur said. Time congealed into commodities becomes abstraced as it is exchanged. C + V + S = -C + V = S, said Arthur, and I wrote. He never moved on from even the most difficult point until all of us had grasped it. He was a good man, a simple heart. I went there every Wednesday night to bask in Arthur’s goodness. The possibility of goodness, I held it tight, as if by holding it I could be saved. Known for its analysis of systems, Arthur’s school was popular with schizophrenics, which should come as no surprise. The gallery is a place where things are held. Born to working class immigrant parents in Phoenix, Arizona in 1939, Ruth Reinprecht changed her name to Maleczech when she moved from San Francisco via Europe to New York. Her invented name being a secret joke or pun: ‘Maleczech’, bad cheque, the kind of cheque she and her art comrades often wrote while they were struggling to get by. A co-founder of the theatre company Mabou Mines, Ruth Maleczech was thought to be the greatest theatre actress of her generation by those who cared or knew. With her formidable intelligence, laser-like concentration and deep bewitching eyes, Ruth’s on-stage presence was perpetually transfixing. You couldn’t take your eyes off her because you hoped, although you never could, that if you watched carefully enough you could penetrate her mind. Ruth taugh acting at the New York Art Theatre Institute. On the first day of class, she dressed in the role of ‘teacher’: a loose cardigan, a grey knee-length pleated skirt. I think she may have put an apple on her desk. Ruth told us on that first day of class, ‘I have an excellent sense of timing’; and ‘Performing is my yoga’; and ‘The puritan work ethic does not apply to art’. Sometimes, she would come up with these koan-like pronouncements, but she could just as easily, beautifully, occupy the space of I don’t know.